2017 was an insane year of fights at Cage Fury Fighting Championships. The fans voted and here are the people's picks for CFFC's overall Fight, Submission, and Knockout of the year! Balmaceda and Solecki walked into the 2300 Arena on May 20th riding impressive win streaks that had folks buzzing about both of these phenomenal prospects. It was an MMA fan's dream matchup stylistically as Balmaceda's striking & wrestling would surely be met head on by Solecki's black belt-level jiu-jitsu game. In round one, it was Solecki who shined, taking down Balmaceda and controlling him throughout much of the round. Up to this point, the BJJ phenom Solecki had tapped out everyone he had fought in the CFFC cage within one round via rear naked choke. Balmaceda hung on though, refused to give into his submission attempts and that is when the tide turned. Rounds two and three consisted of Balmaceda using pin point striking accuracy and terrific takedown defense to keep Solecki off of him and the fight on its feet. Balmaceda unloaded every weapon in his arsenal, but the super tough Solecki kept coming. In the end, it was Balmaceda who won via unanimous decision, but the true winners were the fans who had just witnessed the 2017 CFFC Fight of the Year. The energy inside the Borgata Event Center was electric on February 18th. Many of the fans who contributed to that energy were in the building to see Nick "Pretty Boy" Pace defend his bantamweight title in front of the "Dana White: Lookin' for a Fight" crew. From the moment the first bell rung, it was apparent that this fight would be one to remember. 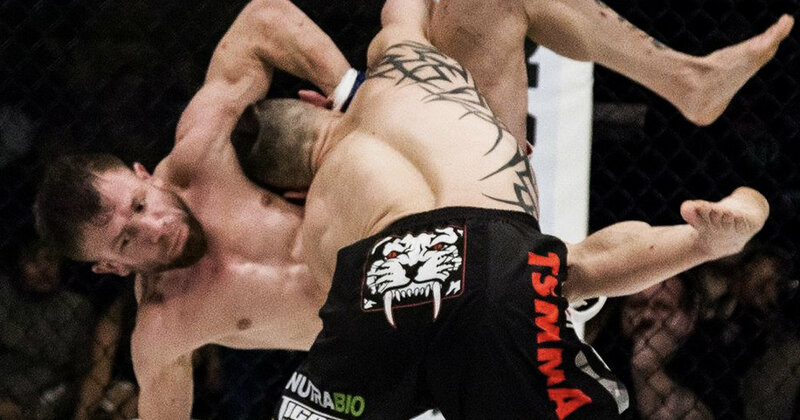 Rounds one and two featured an onslaught of attacks from the challenger Ahmet "The Turk" Kayretli, who was bouncing around the cage picking apart the champ with precision kickboxing. However, as the fight went on, it was Pace who was finding his stride. He walked through everything The Turk had to throw at him and eventually landed a key takedown in round four. Once the fight was on the mat, the advantage for Pace was clear. The BJJ blackbelt UFC veteran began to pound Kayretli before sinking in a tight rear-naked choke and sending the building into a frenzy. Santo Curatolo did his best impression of Yves Edwards' famous knockout of Josh Thompson at UFC 49 against Robiel Tesfaldet in round 1 of their bout at CFFC 69 and ended it with a bang. Midway through the first five minutes, Tesfaldet was looking to get back onto his feet, but Curatolo was close behind and landed an absolutely brutal right high kick. Santo timed it perfectly as he threw the kick while allowing Tesfaldet to turn around. The Staten Island native has burst onto the scene as one of the most promising prospects in the flyweight division in all of regional MMA. 2018 is sure to bring big things for the Tiger Schulmann MMA product. Rich Patishnock vs Mike Wilkins came dangerously close to beating out Cesar vs Solecki at CFFC 65. They were a crowd favorite at the Borgata that night and the winner got a crack at the lightweight crown in their following fight. Debuting amateurs Billy Conway and John Mabrey stole the show at CFFC 67 and held their own coming in a close third with their exciting bout. Ryan Cafaro had his best year ever as a martial artist and almost beat out UFC veteran Nick Pace for submission of the year. Just a few dozen votes behind, Ryan came razor close to finishing this one just as he did with the flying knee at the opening of the bout that got him nominated. Champions Sean Brady, Pat Sabatini, & Sean Santella weren't too far behind. While Santo's spectacular head kick shocked and awed the crowd, a clear trend emerged in the voting for KO of the year...fans love head kicks!! Neck-and-neck with Santo's win was Cesar Balmaceda's headkick of Johnson Jajoute in his last outing at CFFC 66. Cesar has been on an incredible run and the momentum just keeps growing. What's next for Atlantic City's biggest MMA prospect in 2018?